Each fall we do Leaf Prints with Crayola Model Magic. This year we switched it up and did it with Crayola clay. Using clay took more time, but I loved the end result. Roll clay into a ball and flatten on wax or parchment paper. When the clay is nice and flat, gently press a leaf into the clay. Be sure to press all edges and tips into the clay. 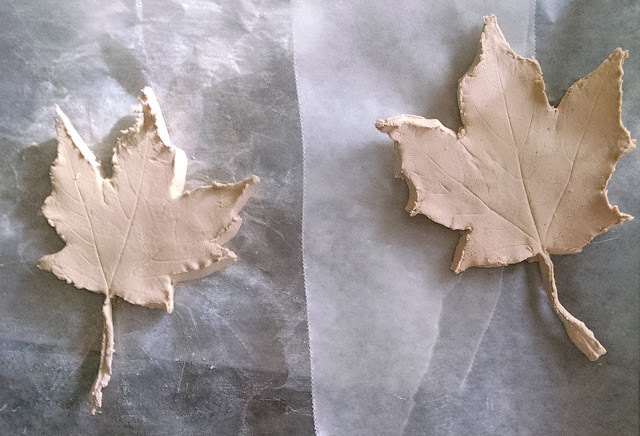 Using a tooth pick, slowly trace around the edges of the leaf, pulling the extra clay away. Once your leaf is completely cut out with the toothpick, gently remove the leaf from the clay. Let the clay completely dry and harden. Once hardened, paint your leaf the color of your choice. Afterwards, we studied the lines in the leaves and even read our book Why Do Leaves Change Color? Great activity and great learning opportunity for young minds. 2015 Holiday Gift Guide for Kids!